We have just learnt from a letter published on the Ocean View Properties on belegal.com thread that Ricardo Miranda Miret has been issued with an arrest warrant by the Courts of Santo Domingo (Dominican Republic). This comes as no surprise since his dealings have been obscure and manifestly fraudulent, but one would have thought that the choice of country, the Dominican Republic, and his supposedly good connections with the President of the country and, it would appear as well with Monaco’s Prince Albert (unless the photos have been manipulated), should have been enough to ensure immunity and, more irritatingly, impunity. But since the above, albeit crucial for the people who invested at Punta Perla, seems still far away and relates to the dealings of Miranda Miret and the previous owners of the land (one of which, CCF21 Inversiones S.L., lost a property via public auction to a client of ours), we have now been made privvy to classified information containing proof of transfers between Sungolf Desarrollo Inmobiliario S.A., Paraiso Tropical, Punta Perla Caribbean Ltd. and Miret’s personal account. We cannot disclose the source of the leak nor the full document but will say that it is a report dated the 17th of August 2006 released by La Caixa Savings Bank on petition of the SEPBLAC (Servicio Ejecutivo de Comision de Prevencion de Blanqueo de Capitales e Infracciones Monetarias), which is the Spanish Anti-Money Laundering Office, investigating the largest corruption case ever seen in a Spanish Court. This report is important, for it specifies the routes taken by millions of USD that left the UK and Spain to different recipients in Spain, the US, Gibraltar, the Dominican Republic and Mr. Miret’s personal account. Paraiso Tropical S.A., which is the company that owns the Punta Perla land, and which is the subject of the fraud court case in the Dominican Republic. 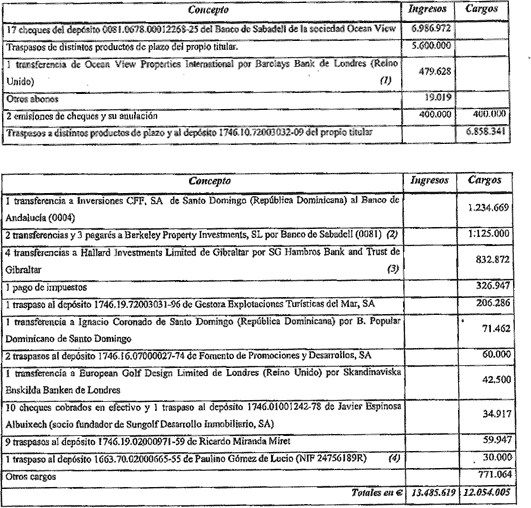 Sungolf Desarrollo Inmobiliario S.L., which is the company that purportedly intended to develop a resort of over 300 units in Estepona (Estepona Beach and Country Club) and which not only did it not purchase the land or applied for planning permission, but in fact shipped the millions to the owners of Paraiso Tropical, a sugar producing company called Central Romana Corporation, cash in hand and till today unknown individuals never related with the business of property developing. Berkeley Property Investments S.L., which is showing today as still owned by Sean Woodhall and administered by Nicholas Stewart Wood (presumably from Grant Thornton, OVP insolvency administrators). Central Romana Corporation, which is a sugar manufacturer based in the Dominican Republic. Hallard Investments Limited, which is a company based at Grosvenor Street, number 17, London. Inversiones CFF S.A., which was one of the shareholders of Paraiso Tropical S.A. allegedly dupped by Mr. Miranda Miret according to the court ruling issuing the arrest warrant. Cash in hand, which was taken out and presumably spent on expensive restaurants and clubs, business lunches, gifts and presents, call girls (according to one source) and any other unrelated-to-property-developing activities. I think I have now done enough, and not because I have other work to do (which I have) but because I am limited to what info I can pick up by spending hours in front of my desktop, a few contacts and this blog (and more importantly, the belegal.com forum). It is now up to individuals who have lost their money to team up, put names and amounts on a piece of paper, get qualified legal representation and file a suit, because it is only then when will the national Governments, with their unlimited resources and powers, will be forced to do something and find out where and with whom did each pound paid towards a dream homes end up. This entry was posted in Uncategorized and tagged arrest warrant, dominican republic, punta perla, ricardo miranda, ricardo miranda miret by admin. Bookmark the permalink.